Interior design at its best is an expression of personal style, creating a comfortable and welcoming environment while also communicating a unique perspective. There are as many twists on interior design styles as there are people, but knowing which basic styles you love most is an important step in finding your niche. One style that continues to grow in popularity is transitional interior design, or “updated classic.” This style can basically be summed up as classic/traditional style with a contemporary twist, reinterpreting old classics with a more modern sensibility. The goal of transitional style is to retain the elegance, sophistication, and familiarity of traditional interior design forms and motifs while giving them a new spin for our modern world. In transitional furnishings, you’ll find many familiar shapes, but with a more streamlined design, placing them firmly outside of traditional styles as well as the minimalist lines of contemporary furnishings. This nod to tradition combined with a cleaner, sleeker design aesthetic helps to create spaces that have timeless appeal and a relaxing atmosphere. Color palettes for transitional interiors often feature neutral, monochromatic colors, which contribute to the sense of relaxation and calm while also keeping the focus on the forms and design of the room. Varying textures and metallic accents keep the design interesting. 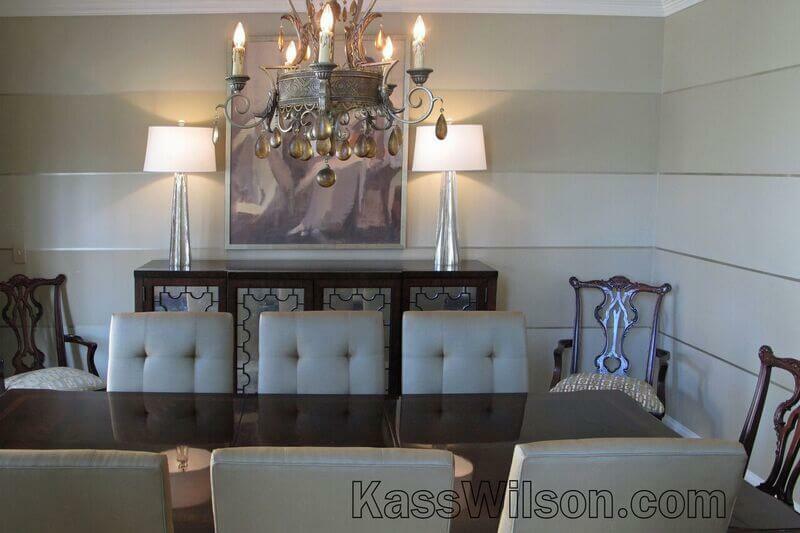 Another aspect of transitional design is the use of traditional motifs in a new way. 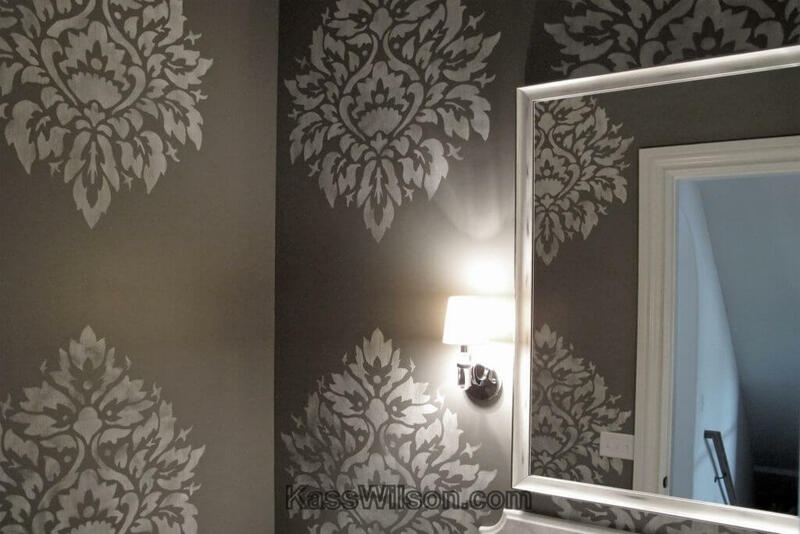 One of our favorite examples of this is the use of traditional patterns like damask or fleur-de-lis in surprising ways, like the oversized damask used in this powder room. 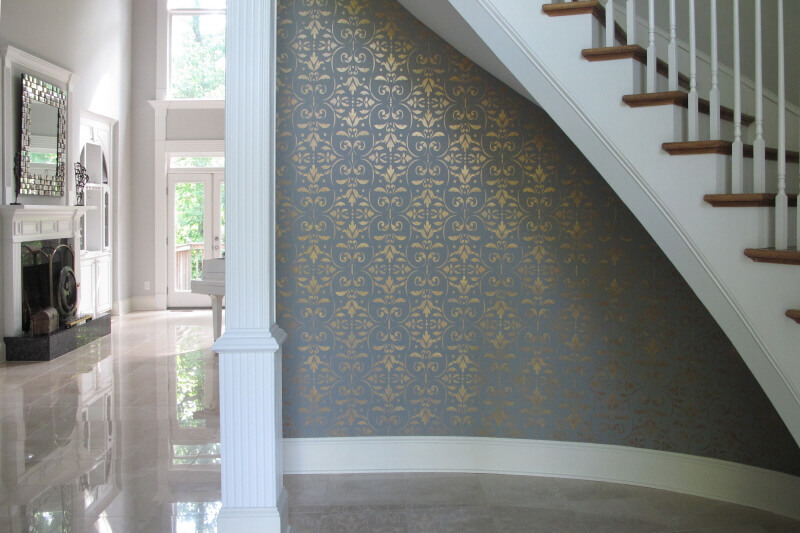 Our Atlanta decorative painting services can help you achieve beautifully custom results, from hand-painted “wallpaper” perfectly customized to the space, to unique finishes that add visual interest to understated spaces. Contact us to learn more about how faux finishes and decorative painting techniques can add a special touch to your next interior design project.